The Belkin Ultimate Keyboard Case for iPad Air 2 makes quick work of your emails, word processing, messaging, and other typing-intensive work. The Ultimate Keyboard Case snaps securely to your tablet, giving you a protective cover with iPad keyboard in one thin package. The case has AutoWake magnets that turn on your iPad when you open the cover and put it to sleep when you close it. 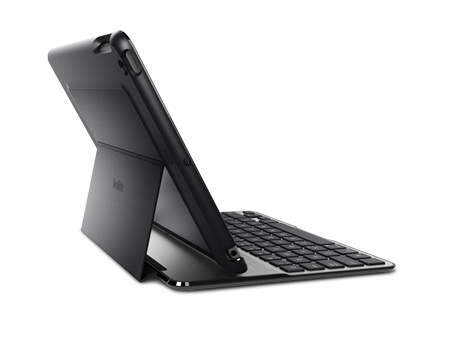 This iPad keyboard case also has innovative precision-hold magnets that secure your iPad in three different positions, so you can find the optimal angles for viewing and typing. When you don't need the keyboard, simply fold the cover back and you can use your iPad comfortably in handheld media mode for reading, watching movies, or playing games. The wireless keyboard pairs with your iPad via Bluetooth®, so you don't have to worry about plugging it in. It also turns on as soon as you place your iPad in one of three viewing positions and turns off when you're done using it, which saves battery life. The built-in rechargeable battery runs for up to 160 hours between charges and up to 1,900 hours (or 6 months) when in standby mode. When you do need to charge it, the included USB-to-microUSB cable makes charging easy.